Love the high country in summer. It’s like getting an extra month of spring. For much of its length through the Western North Carolina mountains, the Mountains to Sea Trail parallels the Blue Ridge Parkway. There is an area near mile marker 434 on the Parkway, beneath Old Bald, where the MST winds through mixed forest and high mountain meadows teeming with wildflowers. The air is cool and the vistas impressive here in the Great Balsam Mountains. There are also plenty of old logging roads making this playground one that is suited for exploration. The region is adjacent to the Nantahala Game Lands, so be aware of seasonal hunters, otherwise you are likely to have the trail all to yourself. Dave and I explored the Mountains to Sea Trail beneath Old Bald on Friday, July 8, 2016 beginning at 10:00AM and ending about 12:45PM. Our plan was to take the Mountains to Sea Trail to Old Bald Ridge and Earl Ammons meadow, then return. Hike Rating: Moderate, almost easy. Not strenuous. Hike Configuration: Out and back, but plenty of options for exploration. Trail Condition: Mostly good. Somewhat overgrown in summer. Starting Point: Milepost 434.2 on the Blue Ridge Parkway. Trail Traffic: We had the area all to ourselves. Perhaps avoid hunting season. How to Get There: Take the Blue Ridge Parkway to mile 434.2. There is a grassy pullout on the south side with enough room for two vehicles. The trailhead is denoted by a rusty iron t-bar. Follow the trail up the hill and into the woods. We started our day by driving up Scenic Hwy 276 through Pisgah National Forest and up the Pisgah Ridge to the Blue Ridge Parkway. From there it was 21 miles of picturesque mountain scenery to our destination. Along the way we stopped at overlooks for pictures and breathtaking views. Some of the sights we stopped to look at included Pilot Mountain, the Middle Prong watershed, the Cowee Mountains, and the highest point on the BRP at Richland Balsam. We were already having a delightful day even before we hit the trail. The trailhead for this stretch of the Mountains to Sea sits in a blind hairpin curve at mile 434.2 on the Parkway. It isn’t a formal overlook, merely a grassy area beside the roadway with just enough room for two cars. Be careful when you pull over because of the blind curve. Traffic could be coming the other way. You will know you have the right spot if you see an iron t-bar about 30 feet up the trail. It was great to have Dave’s friendly companion Grace the Wonder Dawg back on the trail with us. Grace had been nursing a sore paw for a few weeks, so I was happy to see she was back… ready and raring to go. High above you on the north side of the Parkway are the sheer granite cliffs of Old Bald. The trail immediately dives into a mixed forest and then turns south. After about a hundred feet, the Mountains to Sea Trail comes up from below on your right, and the trails merge. Watch for white blaze marks and the occasional concrete trail marker to stay on the MST. The first half mile into the woods I’m going to call the monarda trail. Lined on both sides were hundreds of white and lavender monarda wildflowers, also known as bee balm or bergamot. Some people even call it horse mint. There is bound to be quite a history for this flower to have so many names. We also began to notice the first of what would become many phlox. Watch for the occasional campsite alongside the trail. If you’re an MST thru-hiker or simply looking for a quiet place to settle down in the high mountain woods, these sites are really ideal. Just past a half mile we reached an obvious fork in the road, so to speak. There were no trail markers, but it was obvious from previous traffic that there was a choice here. We knew from talking to Rich and Cindy that the MST plunged through a mountain meadow on the left heading eastward. But we wanted to explore a larger field that we could see less than a mile away toward the south. So we opted for the right fork. As we progressed, this path was more and more grown up with tall plants bending over our route. We reached a very large campsite, with enough flat area to support perhaps 4-5 tents, then continued straight ahead. But not for long. Eventually the trail just petered out. You can see our dead end on the GPS trail map above. So we backtracked past the campsite, and found a grassy forest road heading to the east. Within a quarter mile we came to a junction of grassy forest roads, and a dirt trail heading steeply uphill. While standing there trying to get our bearings, we decided to check out all three. After all, today was a day of exploration. We took a hard right turn onto the south fork and passed by a wonderful stand of pine and hemlock that is refilling the forest since the logging days. We were going decidedly down, even to the point of becoming seemingly lower than the open field that was our goal. But we pressed on. The side of the trail was awash in wildflowers including phlox and daisies, fire pink and yarrow, even a few remaining flame azalea. Knowing for every foot you decline, you have to climb back up, we paused when reaching a sweeping turn in the road to the east. It seemed to us that would take us away from our destination. So we decided to turn around. Too bad. Because looking at the satellite view of the GPS map above after getting back home, all we needed to do was continue around that curve in the grassy road and we would have been right there on Old Bald Ridge. Oh well, live and learn. And now we have the desire to make a return trip soon. The trail was lined with a treasure trove of wildflowers. We made it back to the grassy road junction and decided to take the eastward road this time. We went about a quarter mile, hoping to see open vistas to the south, but the trail remained tree lined. So we turned around once again. Looking at the map later, we could see that this road meets up with the Mountains to Sea Trail about 2-3 miles farther to the east. Another option for the future. Now we were back at the grassy road junction to try the dirt trail up the mountain. It’s very steep, but we hoped also very short, and it was. Within 100 yards we reached another grassy road alongside a rounded knob that was open meadow. I decided to plow through the tall grass and other “meadowy stuff” to look for the Mountains to Sea Trail. My exploration was rewarded as I discovered that this was the Earl Ammons meadow and that the MST crossed at the top. So I went down to collect Dave and Grace, and we all ventured back up to the outcrop in the center of the field. Earl Ammons apparently liked to hunt here. It seems he liked it so much that his family embedded a plaque in the stone in his honor. The outcrop was a perfect place for lunch. Grace lapped up nearly a quart of water in just a few minutes. The weather had been delightful all morning, cool mountain air and a bit of a breeze. Suddenly now, the sky began to look a little threatening off to the west and south. We kept a close eye out while enjoying our sandwiches, not wanting to get caught in this open meadow at 5,400 feet in a thunderstorm. The views from Earl’s meadow are stunning. You are surrounded by the high mountains of the Great Balsam Range in all directions. The meadow was awash in summer wildflowers accentuating the experience. I caught the aroma of spruce and pine, and immediately understood why Earl loved this place. Fortunately bad weather held off, so after 20 minutes or so we continued our trek eastward on the Mountains to Sea Trail. We entered an extremely dark rhododendron tunnel. The ground was covered with teeny, tiny white mushrooms. The farther we went, the more the wispy ground cover began encroaching on the trail. We knew from Cindy and Rich that there was another meadow farther out there, but with the potential for bad weather and the overgrown trail, we decided to turn around once more. But we know how to get there now… either this way on the MST, or taking the eastward fork at the grassy road junction prior. Once we do this hike again, I will post a better map and more clear directions. It probably seems like we are a couple of hiking goofballs, but this day was just one of exploration. We are Meanderthals after all. A longer hike is definitely in our future now that we know the lay of the land. We returned back through Earl’s meadow, and then up the drainage past the higher, smaller first meadow. Once we were back on top of the ridge it was a simple matter of retracing our steps back to the car. On the way back home, we dropped off the Parkway on Hwy 215 and took a country road to Canada, NC and Lake Toxaway. Summarizing, this section of the Mountains to Sea Trail beneath Old Bald has the potential to be a truly stellar adventure. The views are absolutely magnificent. 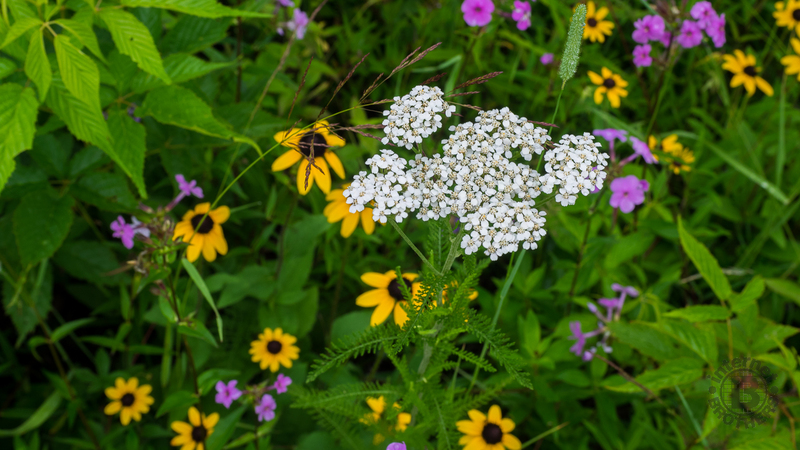 The wildflowers are robust in summer… probably in spring too. The region is laced with retired logging roads through the forest that offer of wealth of options for discovery. There is a continuous stretch of the MST from Doubletop Overlook on the Parkway to Bearpen Gap that would be a great shuttle hike, or overnight out and back. My sincerest thanks to Cindy and Rich for turning us on to this remarkable place. Update September 14, 2016: Time for another visit to this picturesque mountain location on the Blue Ridge Parkway and Mountains to Sea Trail beneath the shadow of Old Bald. The weather was near perfect for hiking and photographs, and we were able to explore some of the terrain that we missed on the previous visit, including a giant meadow. I would add one warning for hiking this area in September — BEWARE OF YELLOW JACKETS! The warning probably holds true anywhere in the Smokies and Blue Ridge. September is mating season so the yellow jackets are excitable, angry, and aggressive. I’ve included another GPS track for the additional trails we explored, and a new photo gallery below the map.